Over the last 20 years, Community Supported Agriculture (CSA) has become a popular way for consumers to buy seasonal food directly from local farms. With the same buy-local spirit in mind, mnartists.org and Springboard for the Arts are joining forces for a similar endeavor to support local art, artists and collectors. Last week the project assembled a panel of local food and culture taste-makers including Lee Zukor (Simple, Good and Tasty), James Norton (The Heavy Table), Chuck Olsen (MNOriginal) and Mecca Bos-Williams (Metro Magazine). The selected artists will receive a commission to create 50 “shares” for the program. Interested consumers/collectors will purchase a share from Springboard for the Arts and in return receive 3 “farm boxes” of locally produced artwork at intervals this summer. Featured works could include items such as: an edition of vinyl 7”, a run of screen-prints, series of small tea cups, run of photographs, tickets to an upcoming performance or event, letterpress editions of a poem or short story, or small original paintings. Each member share will include one piece from each of the 9 CSA featured artist works over the summer and will also include “bumper crop” of additional artwork and arts opportunities. The pick-up evenings will be at local art sites and will be events in themselves, including a special outdoor event for the first pickup at the Walker on June 17th. Member shares cost $300 for the three-month season and can be purchased by contacting Andy Sturdevant at 651-292-4381 or info@springboardforthearts.org. Sales of member shares begin on Monday, April 5, 2010 and will sell out fast. The goals of the CSA program are to support artists and to create an engaged community of local arts supporters. CSA supports artists: in the creation of new work, to establish relationships with local collectors and patrons, and to participate in the launch of an exciting new model of art support and distribution. 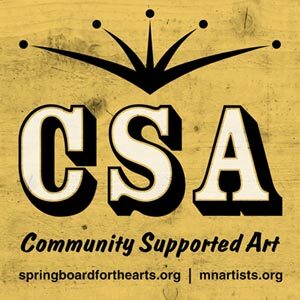 CSA Share member benefits include multiple works of art from local emerging and mid-career artists at a fantastic value! Additionally, CSA Share members have the opportunity to develop relationships with the local artists and art community, discover new artists, explore a variety of disciplines and support artists’ careers and a vibrant community. Springboard for the Arts is an economic development organization for artists. Springboard for the Arts’ mission is to cultivate a vibrant community by connecting artists with the skills, information and services they need to make a living and life. For more than 20 years, Springboard for the Arts has been providing affordable professional development services to artists and their organizations. Springboard’s programs include one on one consulting, workshops, the Artist Loan Fund, Emergency Relief Fund, Artists’ Access to Healthcare and online Job Book and Resource Guide. mnartists.org is an online database of Minnesota artists and organizations from all disciplines. It offers to Minnesota-based artists a central gathering place on the Web, and will grow to become a marketplace and community hub. It offers the public a new way to explore art and get to know artists. In addition to providing artists and organizations with a web page containing images and information, mnartists.org provides news and features about the local arts scene from a variety of sources. mnartists.org was developed as the result of a survey of Minnesota artists conducted by The McKnight Foundation. The survey revealed the survival struggles of individual artists. The McKnight Foundation partnered with the Walker Art Center’s New Media Initiatives group to develop mnartists.org.